The Great Fire of London occurred early in September 1666, causing major devastation to a large part of the city. It came just a year after London had been ravaged by the Great Plague, and five years after the British Monarchy had been restored after a dozen years of Parliamentary rule. In 1651, two years after the Parliamentary coup and fifteen years before the Great Fire, an astrologer named William Lilly published a book entitled Monarchy or no Monarchy in which he purported to depict future events via a series of symbolic illustrations he called "hieroglyphics". According to Lilly's autobiography, the hieroglyphic on page 7 of Monarchy or no Monarchy represents "a great sickness and mortality", while that on page 8 depicts "a great city all in flames of fire". In October 1666, the month after the Great Fire, the government ordered an inquiry into the incident due to concerns that it may have been the work of a hostile nation. To the amusement of many people, the Committee called Lilly to give evidence before them. He was nervous at first, because (based on past experience) he was expecting them to make fun of him. But he was pleasantly surprised to find the Committee took him seriously as a source of information, and just wanted to know whether his astrological skills could tell them anything else... such as the identity of the imagined perpetrators! Lilly explained that, back in 1651, he was unhappy with the rule of Parliament (obviously a politically correct thing to say after the Restoration) and that he "was desirous, according to the best knowledge God had given me, to make enquiry by the art I studied, what might from that time happen unto the Parliament and the nation in general". He went on to discover "that the city of London should be sadly afflicted with a great plague, and not long after with an exorbitant fire"... but added that he could not discern any human culprits behind the fire and hence concluded that "it was the only finger of God; but what instruments he used thereunto, I am ignorant". He finishes his account by observing that "the Committee seemed well pleased with what I spoke, and dismissed me with great civility". From the above, it's clear that as an astrologer William Lilly was taken more seriously than most. 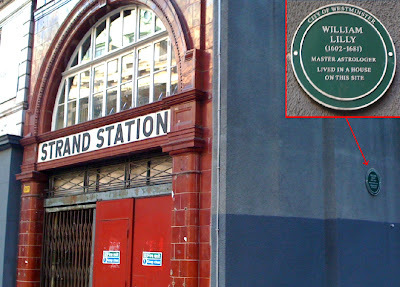 This is also reflected in the fact that there is an official City of Westminster plaque marking the site of his house on the Strand: "William Lilly (1602 - 1681) Master Astrologer lived in a house on this site". As can be seen from the photograph below, this plaque is attached to the wall of the disused Strand tube station (aka Aldwych station, before it closed in 1994).